Take a moment out from the California Beach Festival to stroll westward toward Surfers' Point. As you approach the mouth of the Ventura River, cast an appraising eye. You may wonder where the rubble, concrete barricades, and rusting chain-link fences came from and where portions of the bike path have gone. At low tide, keen-eyed observers might spot the corroded automobile chassis with wood-spoked wheels that lies in the surf zone. Its curious presence marks decades-long efforts to stabilize the shoreline with everything from a demolished concrete bath house built near Surfer’s Point in the 1920s to a tombstone that once marked the final resting place of someone at Cemetery Park on Poli Street. This small, but important stretch of Ventura’s shoreline is one of the most obvious examples of coastal erosion in the county. Living testimony to the folly of building too close to the sea, it speaks loudly to ineffectual attempts to protect such development. Coastal tourism is California’s largest ocean-dependent industry. It brought in an estimated $45 million dollars to Ventura County in 1992, according to “California’s Ocean Resources: an Agenda for the Future,” which was authored by the governor’s office and released in March 1997. Visitors and residents spent $4.1 million on coastal recreation, which the report says is enjoyed by 70% of those who live in the Golden State. Along with providing a wonderful place to stroll, soak rays, and throw a frisbee for the dog, the beach serves as the shore's first line of defense against the relentless forces of the ocean. But this buffer is disappearing, and man is speeding its demise. More than 86% of California’s 1,100-mile coastline experiences erosion at a rate of about one foot per year. On undeveloped shores the sand is free to come and go, cliffs collapse, and dunes are breached during times of high tides and surf. On developed coastlines, man frequently intercedes. Because of erosion, developments that were originally built a comfortable distance from the ocean, today are finding themselves perched precariously on the edge. In years past, “hard" structures were erected to protect them. The seawalls on the Ventura Promenade and at Faria Beach, and rock revetments that line the freeway and Old Coast Highway north of Ventura are good examples. While protecting the structures they front, such coastal armor is now known to alter the natural flow of sand, thereby destroying downshore stretches of beach. At Faria, yesterday’s beachfront home is today’s oceanfront property. Ventura beaches get their sand from up-coast and inland sources; rivers, creeks, and eroding cliffs and shorelines all contribute. But because of the protective rocks and seawalls that extend southward from the Santa Barbara county line, much of this sand is now directed offshore. “There are 11.5 miles of rock revetments upstream . . . and groins, jetties, and breakwaters downstream,” said Steve Chase, assistant city manager for Ventura. “. . . The entire littoral [shore] is a joke." Beaches exist in a state of "dynamic equilibrium.” Sand is delivered, then moved about by daily changes in tides, waves, and winds. The rise in sea level, presence of dams and debris basins, and shape of the beach also influence the flow of this river of sand. Beaches change from season to season. During the winter, when powerful storms blow in from the north Pacific, large pounding waves scour the beach and deposit sand offshore. Subsequent waves break on these sand bars, dissipating their potentially destructive energy before reaching the beach. During the calmer periods of late spring and summer, longer, more gentle waves move sand back to shore. The beach fills in just in time for the tourist season. Ventura County’s coastline has endured a long history of losses to the ocean. 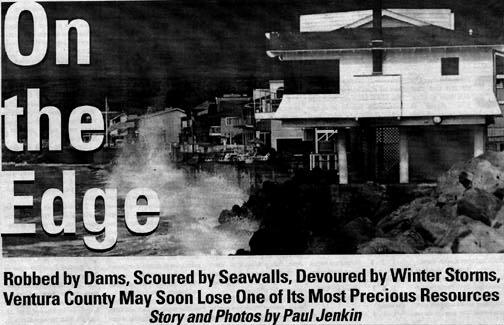 The 1995 pounding of the Ventura Pier—which is now under reconstruction—is perhaps the most dramatic recent example. But it is certainly not the first. Storms during the winter of 1936 destroyed Pierpont’s "Pleasure Pier" at the end of Seaward Avenue. A concrete boardwalk and 40-foot-wide Shore Drive were also engulfed as the sea reclaimed a wide swath of shoreline. Rather than fight the inevitable, many homeowners moved their houses inland as the ocean crept closer and closer. In years of relative calm, beaches retain more sand. Lulled by placid ocean conditions, developers overlook its penchant for destruction, and build in erosion-prone areas. Improvements to Surfers' Point in 1989 are a case in point. Storms during the savage winter of 1983 had damaged an earlier bike path after just two years of service. Subsequent studies of the area recommended that any development along Surfer’s Point observe a 100-foot setback from the high-tide line. Despite the empirical evidence, in the interest of recreation and tourism, the city of Ventura paid for a new bike path and parking lot immediately adjacent to the shoreline on the fairgrounds property. Because of the strong likelihood of erosion, the California Coastal Commission designated the path and parking lot “temporary.” Their lifespan was projected at five to 20 years. But like its precursor, the bike path suffered damage within just two winters. Inundated with requests to fix and protect this popular feature, the city applied for an emergency permit to deposit rock boulders along the shore. The Coastal Commission denied the request as environmentally unsound. Yet days later, the city dumped huge granite boulders on the downshore side of the Ventura River. Chase conceded that building the revetment was "not a smart move.” The structure not only exacerbated erosion downshore, but created conflict between the Coastal Commission on one side and the city and fairgrounds on the other. Gary Timm, district manager of the Coastal Commission’s Ventura Office, said his staff considered charging the city with a violation, but determined there were complicating factors. The rocks, Timm said, were dumped above the mean high-tide line, which was within the city’s jurisdiction under the Local Coastal Plan (LCP). The LCP clearly states that revetments and other protective devices are not allowed on the beach, so the city’s wall building was in violation. The city applied for the permanent permit, the Coastal Commission staff appealed, but their bosses—the coastal commissioners—would not deny the permit, telling everyone concerned to work it out. The revetment has hastened the erosion of downshore dunes by high waves. Since its installation, more than 60 feet of bike path and parking lot have since cleaved into the ocean. Today, an inland migration of concrete barricades and fences that delineate the jagged bike path mark the passing of each big storm. Virtually unusable in its current state, the path and parking spaces at the upper end of the lot continue to disappear into the surf. A study funded by the city of Ventura in 1993 evaluated several projects aimed at solving erosion problems at Surfers' Point. One was a return to 1989 conditions, which would require filling the eroded areas and protecting the immediate shoreline with either a cobble berm, a rock revetment, or a stepped seawall. Costs for these barriers, not including permits and future maintenance, were estimated at $1.2 million for the berm, $2.2 million for the revetment, and $3.6 million for the seawall. Another option, demolishing the fractured bike path and relocating it to Shoreline Drive, would cost $119,000. In an effort to resolve conflict between the city and the Coastal Commission and solve the erosion problem, State Senator Jack O'Connell formed a "working group" in early 1995. It included representatives from the offices of Assemblyman Brooks Firestone, the city of Ventura, state Fairgrounds, California Department of Parks and Recreation, California Coastal Commission, California Coastal Conservancy, and the Surfrider Foundation. Mark Bailard of the Coastal Conservancy served as facilitator. The group considered two options: 1) hardening the coast and rebuilding the bike path and parking lots at their original sites, or 2) relocating the bike path to Shoreline Drive. After much discussion, the working group still could not agree on a solution. The majority preferred relocating the bike path landward, because it was the cheapest and most environmentally sound. But the fairground board of trustees didn’t go for it. Their desire to restore the property to its 1989 condition and protect it from the sea with rocks, squelched consensus. As a result, the working group disbanded late in 1996, and nothing has been done since. Representatives of the fairground did not return phone calls. Kris Kuzmich, an aide to Senator O'Connell, said her boss “expresses a high degree of frustration in the matter.” All the parties involved appear to echo the sentiment. Everyone but the fairground board acknowledged that another seawall would likely spell more trouble for Ventura's downshore beaches. Further loss of sand would likely jeopardize the storm-plagued pier, the state beach, as well as Pierpont beaches. Would more rocks and seawalls necessarily follow, armoring the coast all the way to Ventura Harbor? Like an abandoned car, the revetment is illegal, and it doesn’t appear to be going anywhere. But the bike path and parking lot do. Given the destructive nature of armoring the coast, “soft” approaches are gaining ground. The idea is to maintain the buffering ability of the beach by adding sand to it. To aid in a “managed retreat” of the bike path and parking lot, and help restore the area around Surfer’s Point, there has been talk of "backpassing" some of the sand now dredged from the mouth of Ventura Harbor west to the popular recreation area. Recycling sand would also help to restore the eroded dune area and provide additional material for the beaches between the river and the harbor. Dredging consultant, Richard Parsons, said that sand grain size would not be a problem; money is the big consideration. He suggested that further studies may be needed. Each year, an average of 540,000 cubic yards of sand are dredged from Ventura Harbor and bypassed down to the mouth of the Santa Clara River at a cost of $1.5 to $2.5 million. Parsons estimated that it may cost another half a million dollars to redirect the sand upcoast. Brian Brennan, former president of the Ventura County Chapter of the Surfrider Foundation and now a candidate for Ventura City Council, has long supported such soft solutions. He expressed excitement at the prospect. "The hope is that replenishment will help the beach heal itself,” he said. Parsons noted that the levee at the Ventura River also should be studied to determine if it needs to be modified. It is believed that because of its current configuration, sand brought to shore by the Ventura River may be pushed out to sea, rather than nourishing the starving beaches at Surfers' Point. The Surfrider Foundation, an environmental group devoted to ocean related education and protecting beach and ocean resources, would eventually like to see the release of inland sand supplies now held back by dams. Twenty miles up the Ventura River, more than 11 million cubic yards of sediment lie trapped behind Matilija Dam. The material represents the accumulation of almost half a century of sand that Surfrider and others say should be on the beaches. During the life of Matilija Dam, heavy siltation and structural defects have reduced the water storage capacity by more than 90%. With Lake Casitas now serving as the area's primary reservoir, Matilija has been rendered obsolete for anything but flood control. Proponents would like to see its removal, which would allow sand to flow freely to the beaches. It would also provide access the endangered steelhead trout with access to its historic breeding grounds in the upper reaches of the watershed. While dam building has been a popular pastime during the last century, dam removal is a relatively new idea. A study of the Ringe Dam in Malibu, which is similar in size and scope to Matilija, estimates that dismantling the dam would cost anywhere from $10 million to $20 million. While this would seem to be a large sum of money, the artificial nourishment of regional beaches to make up for the shortfall of river sediments runs as high as $5 million per year. When people build too close to the beach, the threat of damage from erosion eventually becomes a problem for the entire community. Costly protective measures are often footed by the taxpayer for the benefit of the private property owner. The ultimate cost is the loss of precious beach. Political stalemate has stalled any solution to the problem of erosion at Surfer’s Point. Decaying asphalt, concrete barricades, and chain-link fences remain an unsightly reminder of a good idea in a bad place. As Chase put it, it is "a very precious resource that looks battered and torn.” Meanwhile, the bike path sits at the edge of a restless ocean, which this winter, may be stirred by the most extreme storm season on record. To understand coastal erosion it is first necessary to consider the bigger picture. 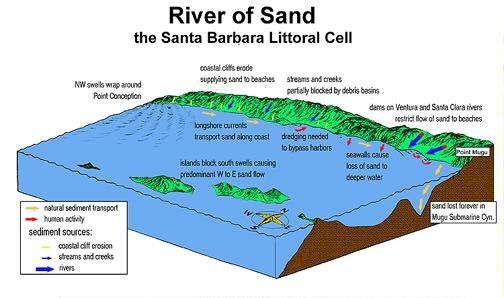 Ventura County beaches are part of a larger system called the "Santa Barbara Littoral Cell,” which includes the mountains and beaches stretching from Point Conception to Point Mugu. In Ventura County we get sand from sources as far west as Point Conception. Since most of the waves that strike our shores emanate from the west, this "river of sand" flows toward the east. Sand that is on Ventura's beaches today will soon be in Oxnard. The analogy of the beach as a river of sand becomes most evident when rock jetties are constructed perpendicular to the shoreline. Designed to stabilize inlet channels or harbor entrances, they interrupt the longshore current. Sand accumulates in the harbor entrances and on the updrift side of the jetties, while downdrift beaches, starved of their sand supply, undergo increased erosion. In order to keep harbor entrances open for navigation and to nourish downdrift beaches, trapped sand must be removed and deposited down the coast on a regular basis. The importance of bypassing sand from one area to another became evident at Hueneme Beach during the summer of 1996, when waves generated by a large south swell stripped the beach. Located downdrift of the Port of Hueneme jetties, Hueneme Beach relies on sand dredged from the entrance of Channel Islands Harbor by contractors for the U.S Army Corps of Engineers. The dredging program normally requires 1.1 million cubic yards of material every two years at a cost exceeding $5 million. In 1995, federal budget cuts provided for only 40% of this amount. As a result, Hueneme Beach receded drastically, and required emergency sand replenishment before the sea reclaimed public and private properties. The river of sand flowing south of Ventura Harbor amounts to roughly 1 million cubic yards per year. To give some perspective, a large dump truck holds about 10 cubic yards. One million cubic yards of sand per year is equivalent to 100,000 truck loads, or one load dumped every five minutes around the clock all year long. All this sand eventually makes it as far as Mugu Canyon, a huge submarine trench that comes to shore near Mugu Lagoon. At this point, the sand flows down into the deep ocean, forever removed from California beaches. Film footage has shown the river of sand disappearing down such canyons. The river of sand is in constant need of new supplies to maintain the beach, but human activity has greatly altered the natural system. During the past 50 years large quantities of sand have been trapped by river dams. Today, about 42% of the Ventura River watershed is blocked behind such structures at Matilija Canyon and Lake Casitas. It is estimated that they deprive the coast of 30% of the sediments historically provided by the Ventura River. Large quantities of sediments also are trapped by flood control debris basins on smaller streams. Worsening matters, private industry has a history of mining riverbeds for sediment originally destined for the beaches. If you haven’t heard of the El Niño phenomenon by now, perhaps you had your head in the sand. An increase in the frequency and severity of this oft-discussed shift in weather patterns associated with warm ocean waters off the coast of Peru, is also thought by some scientists to be connected with global warming—a controversial theory that such human activities as the burning of fossil fuels are increasing global temperatures. The extent of this effect has yet to be determined. It is a fact, however, that the planet has been warming steadily since the last ice age. Warmer temperatures melt polar and glacial ice, adding large volumes of water to the oceans. The resulting rise in sea level has been estimated at six inches per hundred years since the end of the last ice age, about 17,000 years ago. A recent UN study on global warming suggests that sea level may rise as much as two feet by 2040. This relatively rapid increase, combined with increased storm activity, spells more bad news for the already stressed coastlines of the world. Increased sea levels will mean even more erosion. A USC study released this year estimated that over the next 50 years, southern California’s shoreline might move landward as much as 75 yards. If that’s the case, tough public policy decisions will have to be made as to how best to protect beachside properties and manage the beaches.